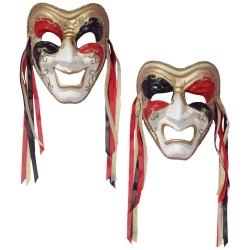 The Comedy and Tragedy Venetian Style mask is perfect for Mardi Gras celebrations, masquerades, and other costume parties. Many of our directors and theatre teachers also use this mask for theatrical gifts or as decoration for the theatre. The comedy and tragedy Venetian masks are colored as pictured and are made of rigid plastic with a crackle paint finish and gold trim.